A Storm of Light? More like A Storm of Tight. Now that we got that joke out of the way it's time to dig in to what is one of the most exciting heavy releases of the year. A band who fought their way to somewhat legendary status it is interesting to hear back from these guys after half a decade of silence. 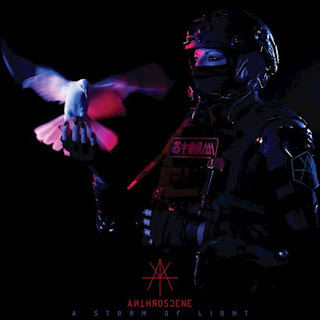 The post rock meets doom metal legion has refined something on their latest offering Anthroscene that is incredibly powerful, a clear step beyond many of their musical ancestors but also pushing for bold new vistas. What strikes me about this record is the powerful dynamic interplay that the band uses to contorl their ebb and flow. The raging moments are interspersed between moments of laid back musical exploration. you can in one song simultaneously feel a sense of almost terrifying openness and then feel like you've been caught in a cripplingly small box. The energy of this band is unique and at times bizarre. You may find yourself choking on the cruel bit of an angular riff whilst simultaneously wide eyed at how massive they sound. This sense of depth is interesting because, unlike many of their peers in the genre it does not come from the guitars, but rather the synths which provide eloquent padding. A tastefully put together and wonderfully artful record, Anthroscene further guides the evolution of these New York visionaries. Fairly divorced from a lot of modern conventions and unafraid to explore it's easy to be fascinated by the wondrous exploration and expansion that this band so eagerly delves into. Pummeling forward with transcendent and mystical strength there are a lot of layers worth unpacking here. An album that demands multiple listens, it's going to be hard to not want to come back time and time again.